Yes I know you like to express this view. Maybe, and hopefully, you will eventually, before the brain stops functioning, become just like you were when you young, that is; completely non-dogmatic, did NOT THINK any thing was absolutely true, and just KNEW what IS absolutely true. Why do you THINK the functioning of that brain is NOT at ease when a human body is in front of you ? Why would spontaneity put the functioning of a brain not at ease ? Okay, but I am not sure why you are telling me these things about you, which are NOT really related to the actual questions that I am asking you. The real question is why are you and “ken” talking about things that have absolutely nothing whatsoever to do with the topic of this thread? Yes that is true. Also, the absolutely different definitions, and thus also different meanings, we give to words also helps in the lose of translation. For example, I could easily say that my first question was definitely NOT about 'your mind' but that would only get lost in translation, so I will NOT say that now. Now, this is a much better point. i can NOT accurately speak for surreptitious57 but the reason i was doing this is because i got off topic and had not noticed. No I'm defending the conclusion as at least a possibility. It implies time is circular. No I'm defending the conclusion as at least a possibility. Ah okay. That is fine then. It implies time is circular. I do not see how it implies 'time' is circular, but so be it. Or if Einstein's conception of space-time is correct, there is no space-time in the nothingnesses. It simply does not exist because it has no time co-ordinate. 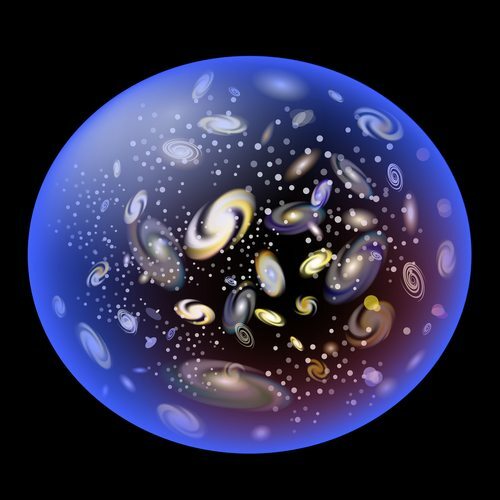 Spacetime may have started at the Big Bang and expanded out from there. Your response doesn’t seem to have anything to do with the issue I was raising with you. Because what does the subject of time have to do with the concept of infinity? ...we understand that according to the Big Bang theory, our bubble of reality appears to have come into existence at a specific moment approximately 13.8 billion years ago. And as such, it thus allows us to use that moment as a “marker” that divides the eternal past from the eternal future. Separating the Universe from Eternity is problematic because if the definition of Universe is ALL THERE IS then logically that would include everything outside of the Universe . But there ALSO can NOT be any thing nor even no thing "outside" of the Universe. As you incorrectly stated but correctly suggested; if the definition of 'Universe' is ALL-THERE-IS, then that would have to include absolutely EVERY thing, which obviously any thing AND no thing is a part of. For example, let us say that if you imagined that the Universe was of a particular size and limit and there was nothing 'outside' of that size. If one is going to define the 'Universe' as ALL-THERE-IS but NOT the "nothing" on the outside of that imagined Universe, then that is different. But, IF the definition of 'Universe' IS ALL-THERE-IS, then that is what it IS. This means that if there is any region of nothingness, nothing, and/or no things, "within" or "outside" of an IMAGINED limit, then that MUST BE and is still included in the definition of the 'Universe'. Now, obviously there is NO boundary, limit, nor barrier to ALL-THERE-IS. Therefore, IF the word 'Universe' means ALL-THERE-IS, then the Universe IS infinite, AND eternal. To IMAGINE that there is an "outside" of ALL-THERE-IS is to imagine some thing that does NOT exist. Of course one can make a model or draw a picture TRYING TO depict the Universe, Itself, like seeds has, and show a defined line of separation between things, and no things, but the region of no things is STILL a part of ALL-THERE-IS. which obviously has NO limit. Thus again infinite. Also, in that picture of seed's Universe there obviously could NOT be a distinct separation between physical things, and nothingness, like shown in that picture. This is because there will ALWAYS exist a separation of space or no things between physical things and so to draw a distinct line like shown is a truly inaccurate depiction of what IS actually Real and True. To be able to SEE and UNDERSTAND this, just imagine that there was a supposed "limit" to the Universe again. Now imagine you are standing on a planet on the very "outer edge" of that "limit". Now when looking at the next planet or star along that "outer line" of the Universe. There is a region between you and the next planet/star of no things, nothing, and nothingness. Now could you point anywhere and SHOW another person a distinct line of separation between the "inside" and the "outside" of the Universe? Or, could you just SHOW an imagined distinct line of separation? If it is the latter, then that IMAGINING is ALL any one is doing when they say there is an "outside" of the Universe, Itself. Human beings do have a tendency of doing this IMAGINING what IS the Truth, instead of just LOOKING at what the actual Truth IS. If, however, it is the former, then can you explain how you could possibly do this?